Wondering what to make for dinner tonight–how about these Cheesy Sausage and Spinach Roll Ups? With the help of Jimmy Dean Sausage Crumbles this recipe is easy to put together and tastes absolutely amazing! The kids loved ’em! Here is a step by step photo guide of how to make this tasty dish, but if you prefer just to see the written out directions, scroll to the bottom of the post and you can just read it like a recipe card. 🙂 Let’s get started! This recipe would be delicious with fresh spinach, but as I mentioned above, I didn’t pre-think through this dinner so I used what I had on hand, which was frozen spinach. My box of spinach turned out to be 2 years expired and had picked up some “freezer flavors”…word to the wise…check the date on your spinach if you dig it out of the BACK of the freezer! Start boiling you Lasagna noodles. I had room for 15 lasagna noodles in my casserole dish in the end, but only had 13 unbroken noodles in my box. So my final dish looked a little odd but still tasted great! Once your noodles are done, drain your water and lay them out to cool on cookie sheets. Carefully use a spatula and transfer each noodle from the pot to the cookie sheets. It only takes 2-3 minutes for these to cool enough to get rolling. 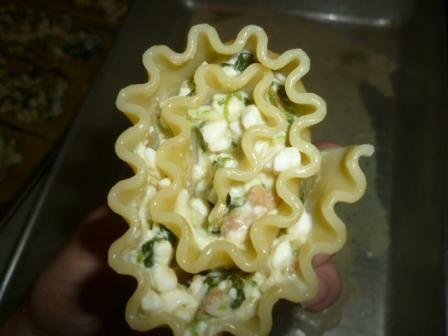 While your noodles are boiling–since that is the most time consuming part of this process–make the filling! 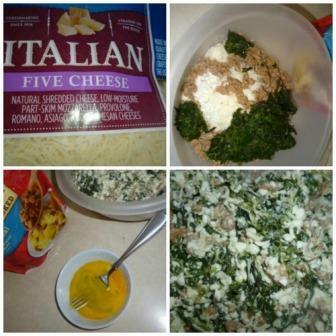 In a medium sized bowl combine, 1 cup of shredded cheese, box of thawed spinach, cottage cheese, Jimmy Dean Sausage Crumbles and 1 egg. I used a 5 cheese Italian blend for the cheese so I could have several different flavors, but you could any kind of cheese. 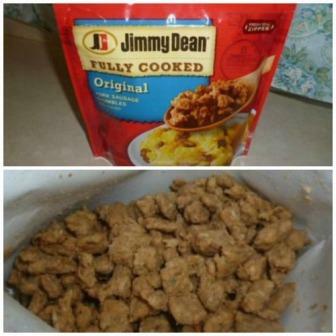 Before I move onto the next step I have to give a shout out to these Jimmy Dean Sausage Crumbles….they make life so easy! They are already cooked, I don’t have to deal with the un-thawing, cooking, and most of all the GREASE. These little sausages are perfectly crumbled and not having to deal with left over nasty grease is almost priceless to me! 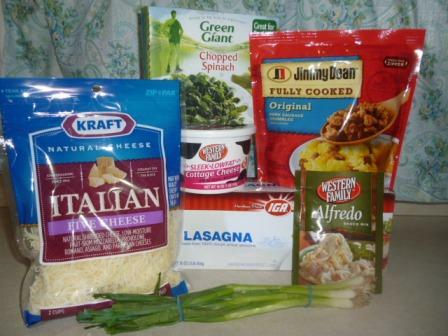 They mix in really well with tons of recipes I already make each month–it just simplifies dinner for me! Once your noodles are cool enough to touch and your filling is done, preheat your oven to 350 degrees F. Then it is time to start filling and rolling! 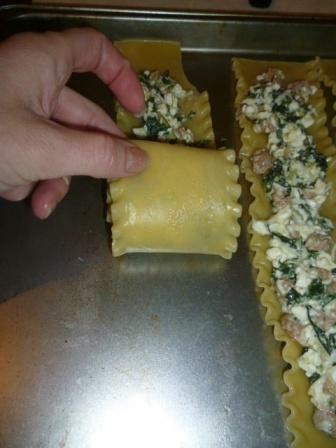 Begin by spooning the filling onto each cooked lasagna noodle leaving about 1 inch on one end clear so it will stay rolled. Top off with Alfredo sauce and remainder 1/2 cup of cheese. Bake in the oven at 350 degrees F for 20 minutes or until the cheese is bubbly on top. Garnish with scallions. Then it is time to enjoy! My kiddos devoured this, despite our expired spinach situation. I can’t wait to make it again! Here is a “recipe card” for easy reference. Begin to thaw your spinach in warm water while in the packaging. Boil 15 lasagna noodles. 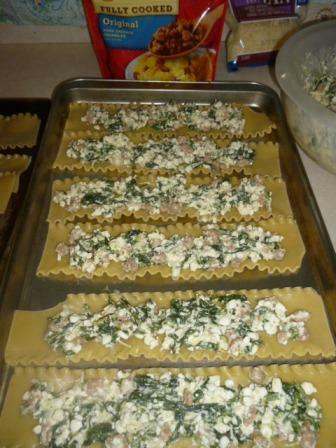 While noodles are boiling make the sausage/spinach filling. In a medium sized bowl combine, 1 cup of shredded cheese, box of thawed spinach, cottage cheese, Jimmy Dean Sausage Crumbles and 1 egg. Once your noodles are cooked lay them out to cool on cookie sheets for 2-3 minutes. Spray a 9×13 casserole dish and cover bottom with Alfredo sauce. Spoon the filling on each noodle leaving 1 inch on one edge so it will stay rolled. Roll. Place in rows of 5. Top off with Alfredo sauce and remainder 1/2 cup of cheese. Bake in the oven at 350 degrees F for 20 minutes or until the cheese is bubbly on top. Garnish with scallions. Enjoy! 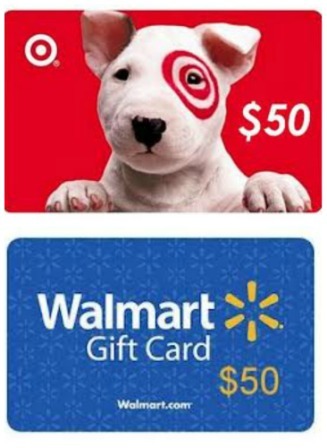 Jimmy Dean has offered to give one of my readers a $50 Target or Walmart gift card! You can try all 3 varieties of sausage crumbles and buy a whole lot more with that free $$! This giveaway will end on Monday April 7th at 11:59 pm EST. Open to US residents only. Winner will be pulled from the Rafflecopter form via random and the winner’s entries will be verified. Winner will be contacted via email. Good luck! Love how the spinach rolls look!! thanks for the chance! and GOOD LUCK ALL! Love this recipe, husband loves sausage and spinach both! Love this recipe, husband loves sausage and spinach both! Good luck to all! I don’t eat meat, but use soy sausage all the time. I really like it with roasted new potatos, and this sounds really good. I have saved it. I love this recipe!! Can’t wait to try it!! I would make the roll-ups when I can find gluten free noodles. They look delisious. Your recipe looks delicious and I want to try it. I have used the crumbles to make omelets but this just looks incredible. This looks so easy and amazing! Going to make it over the coming weekend for a family dinner! Thanx! Your recipe looks absolutely delicious and not too complicated! We always love breakfast casserole. I’d try one with croutons instead of bread, though. I like the recipe. I’m going to try it! I’d like to try the spinach rolls. I think my family would like them. This recipe looks fun and easy. 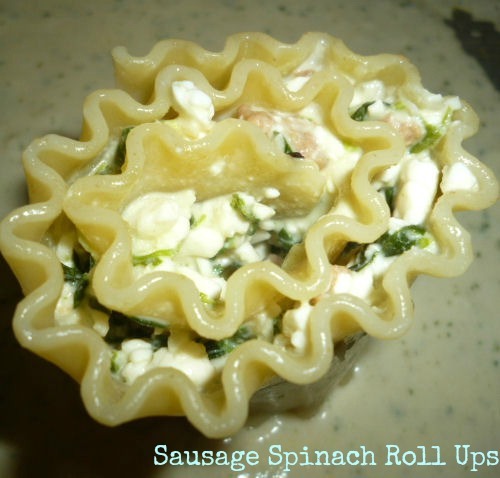 Your sausage spinach rollups look awesome and I cannot wait to try them. I can see myself making a sausage and cheese omelet. mmmm.. this looks great. I’d also love to put this in some sort of a breakfast omelette scamble or something… or mayble a lasagna. I would make breakfast omelettes. 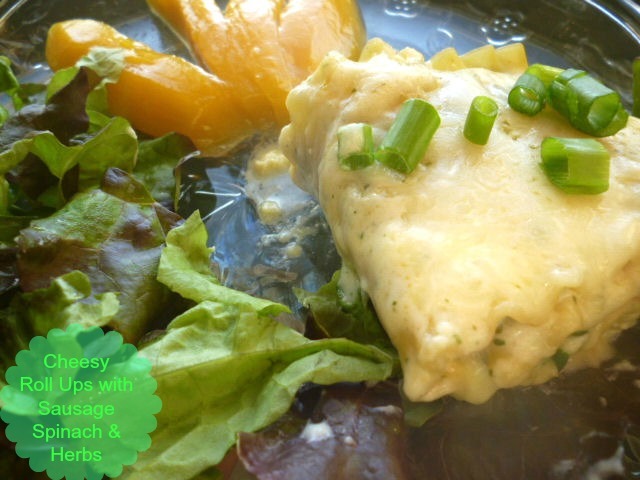 I like your recipe a lot and it looks easy to make and very healthy and delicious! I will have to try to make your Sausage Spinach Rolls! This looks really good. I would love to make it! I liked your recipe. It looks delicious. These sausage crumbles are also great in scrambled eggs with sauted onion and mushrooms. I could see myself making lasgna with this! I am sooooo going to make this. In fact I’m heading to the store shortly and I’ve copied all ingredients so I can pick them up and make this tonight. This recipe looks fantastic and I like that it’s a great way to add some greens into the meal. I think it looks great, and I may give it a try—I think my family would really like it! Good way to eat get everyone to eat their veggies. I think this recipe looks great! I think it looks so elegant, I would love to serve this to my family! I would love to make a cheesy sausage omelette, thanks! I love this recipe! I love lasagna, but haven’t made it in a long time. 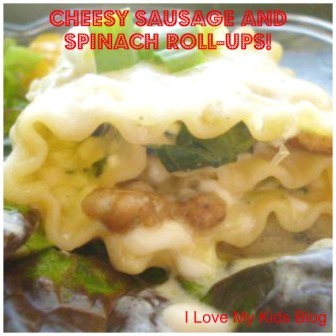 The rollups make it seem much simpler and I adore sausage and spinach on pizza, I think I would love it in lasagna! I would like to have a nice omelet with the crumbles – and mix in red pepper and onions!!! I’d also like to make my own stove-top stuffing with it!! Your recipe sounds delicious. I would probably use them in a breakfast casserole. I think the recipe is great! 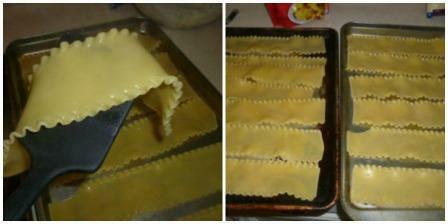 I love making pasta rollups! Would put sausage on a pizza. I would totally make this recipe–it looks delicious! I would either use sausage crumbles for this or for to make mini pizzas. Your recipe looks really good. I would make breakfast burritos. LOOKS DELISH, AND IM UP FOR TRYING ANY NEW RECIPES, ESPECIALLY INVOLVING SAUSAGE CRUMBLES! looks great. I will have to try this for my picky family. This looks really good! I love cheese so it’s perfect for me! LOL on the spinach! I like your receipe..looks easy to make! thanks for this idea. I like your recipe but I think I would make a cheese and sausage pizza. Your recipe looks really amazing! I can;t eat too much tomato sauce as it upsets my stomach so Alfredo or ricotta is perfect! Your Cheesy Sausage and Spinach Roll Ups recipe sounds wonderful. I will definitely try making it. It looks really yummy. I Love spinach. I would just make my own alfredo sauce though. It looks really yummy. I Love spinach. I would just make my ow sauce though. Your recipe looks delicious! I would use the crumbles in a breakfast casserole. Are you kidding? These look wonderful, and I am going to make them! i would make spaghetti squash and meat sauce using these. Recipe looks delicious! I bet my kids would love it! These look delicious to me! Love this recipe, husband loves sausage and spinach both! i love to put it in scrambled eggs. I would make lasagna, and I have already made it with these crumbles. Worked great! Just threw them into the simmering sauce after chopping them up a little finer. Not very creative I know, but thats the truth! It looks delicious! I like spinach with anything. I would make pizza with mine! I think your recipe looks great and I am not surprised that your kids gobbled it down. I would prob add the crumbles to a regular lasagna recipe. this really looks like a tasty recipe. i think my husband would enjoy it a lot. i would, too. my 4yo wouldn’t though. she despises meat. i think it’s a phase. LOL thanks for this giveaway! hope i win! I think it’s very creative and looks good! What a fun way to do individual little roll-ups!! This is the kind of recipe that goe over well in my house. I will give it a try. I buy Jimmy Dean for quick meals a lot lately. I love this. We are going to have leftover lasagna rolls tomorrow. We had extra last time we made them so froze them. This is another great way to make them. Your recipe looks delicious. This is something my family would enjoy. love the recipe, but i dont eat sausage. but love veggie and spinach rolls. I love this recipe and definitely want to make this!!! Your recipe looks really tasty…I must just give this one a go. Oh those rollups look so good! 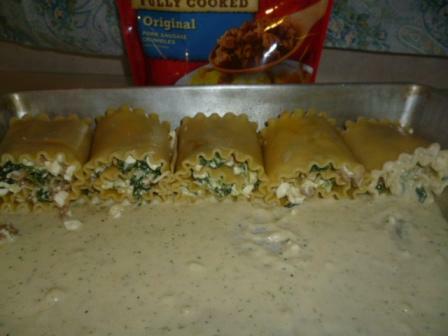 We love lasagna, but have never tried the rollups before. I love that it has the alfredo sauce in it! Cant wait to try this one! My kids would love this. Let’s face it anything with cheese on it is a winner. I think the sausage crumbles would also be great in juevos rancheros. I will be trying your recipe. It sounds so good. This recipe sounds so yummy. I would also do this with a spicy marina. Your recipe looks good. I think I might try using the sausage crumbles when I make lasagna. Thanks for the recipe idea! It looks good and easy, I’ve never made a roll up before. like your recipe,i’d make a pizza! This recipe looks awesome!! I can’t wait to try it! 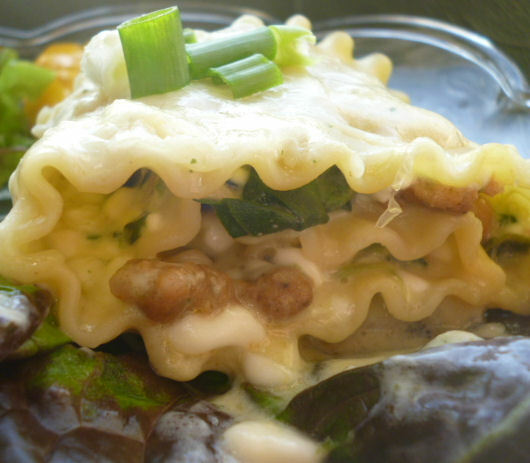 It uses ingredients I usually have on hand, and I’m always looking for recipes using lasagna noodles! I would add the crumbles to my freezer breakfast burritos! This recipe sounds and looks yummo! This sounds so good. I love spinach! This looks wonderful.mmi am definitely going to make it. This looks wonderful. I am definitely going to make it. This sounds yummy! I’m going to the store today. I’m going to pick up the ingredients for this and try it tonight. Thanks! I think I would love your spinach rolls but I’d be the only one in my family. I’m not very creative so I would use the crumbles in a breakfast quiche for my family. Your recipe looks delicious! I think my family would love it. I learned a new way to make yummy food with spinach in it. My daughter would love this with the Alfredo sauce. I learned a new way to make yummy food with spinach in it. My daughter would love this with the Alfredo sauce. I appreciate the photos showing how to do the steps. I think the recipe looks good! I’ve made something fairly similar! I really like your recipe. So much that I printed it out and will be trying it. 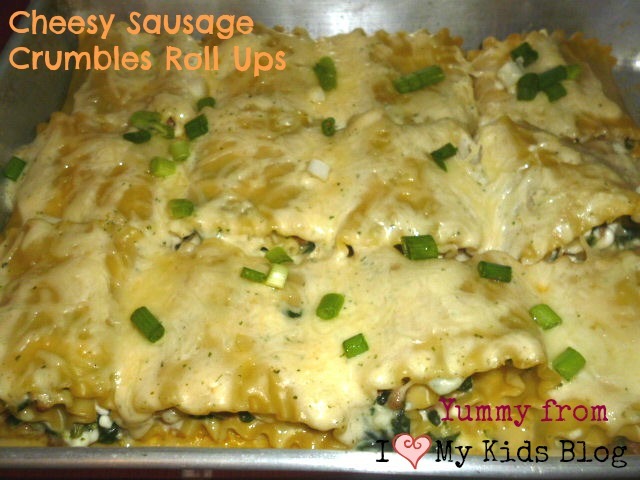 This looks yummy – and it would be something I could make & let my grands help w/the roll-up process — they would love it! Thanks for the chance…. This recipe looks great! I am going to HAVE to try this! I think I would try some sloppy joes with this, my husband loves them! Maybe give it a new kick! I think these look good. My husband loves spinach. However he doesn’t care for ricotta cheese maybe I could try this with a cream cheese or something different that he will eat. Or maybe I just won’t tell him it’s ricotta. He can be very difficult sometimes. I would also use the sausage as a pizza topping in eggs, sauce or maybe just cook it up w/peppers and onions and make a sandwich. So many uses and so quick and simple to cook. The Cheesy Sausage & Spinach Roll-ups look good. They look like a tasty new twist on lasagna. I wouldn’t mind giving them a shot. I think your recipe looks yummy! It makes me want a do over for dinner. I think the recipe is just my taste. Did you come up with this recipe yourself? I’m definitely making this. This recipe looks delicious…but, how could you miss with sausage, spinach and pasta? I think your recipe looks delicious and is worth a taste! Your recipe looks really good! I want to try to make it. I love your recipe, especially that you included spinach! I would love to make a breakfast casserole with the sausage crumbles, eggs and cheese. I’d use it on top of pizza. How exciting – thank you so much!!! I would love to have the Target card and purchase the hot and spicy crumbles. I’m hosting a birthday brunch in May, and will be making frittatas with the crumbles. It will be a perfect addition to the menu and I’m sure everyone will love it. I’m very grateful to be the lucky winner – thank you again!